Great for big groups like weddings, reunions and bachelor/bachelorette parties, our Catamaran Tours invite you to reserve your own private boat and cruise along Jamaica's west coast. Stop at Rick's Cafe, snorkel and/or cave swim. What you'll love most is partying with the boat crew while enjoying an unlimited open bar. The Private Catamaran is available on Wednesdays, Fridays and Sundays. Includes snorkeling and cave swimming. *Please be advised that times are subject to change based upon season. .
Group has option to swim to Rick's dock or rent a shuttle boat for an additional $120 USD. Rates determined by group size. Please contact us for a custom quote. Party with fellow Negril travelers on our Sunset Catamaran Cruises, offered seven days a week. Family friendly cruises sail on Mondays, Wednesdays, Fridays. and Saturdays. Begin and end the cruise at Negril's famous beach attraction, Margaritaville. Guests can enjoy snorkeling and a brief visit to Rick's Cafe. Open bar included. Private Catamaran Cruise includes round-trip transportation from 7-Mile Beach and Bloody Bay, open bar and snorkeling gear. An additional fee will be incurred for transportation from West End locations and Montego Bay. 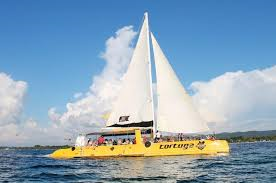 Public Catamaran Cruise includes round-trip transportation from all Negril locations, open bar and snorkeling gear. Public catamaran includes shuttle boat to Rick’s Café.